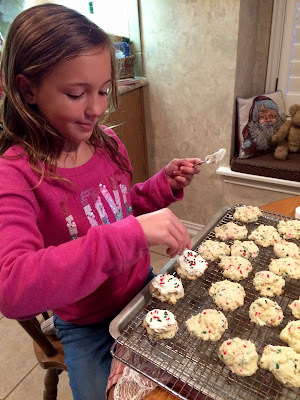 Hi Kitty, oh these cookies look so nice that Cissy made. I love that cute Santa too. 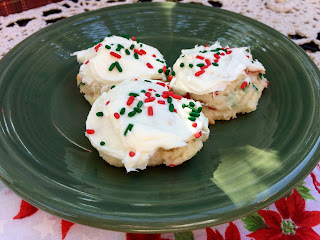 Thanks for the recipe to make these cookies and sharing it at C&C with J&J. I had a great time at the yarn store and thanks for the sweet comment on the crochet stars i made. Enjoy the week. Your tea cup is ever so sweet and whimsical, my friend. And speaking of sweet, those cookies look ever so delicious! Love and hugs to you! Those cookies would be great to make with my granddaughter. 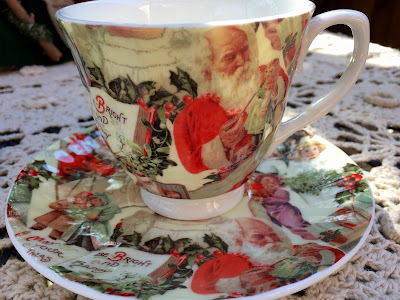 I love the Victorian style Christmas teacup! Hi Kitty!What a beautiful table for Christmas,love the pretty Santa too,so cute!The cookies look delicious!Hugs to you and Cissy! You just can't have too many teacups right Kitty? I love cake mix cookies, these sound divine and I've pinned them to my Christmas Eve party board to make! Ho Ho Ho! What a delightfully festive tea party! Love your vintage looking cup. And those cookies! I've been looking for a nice cake mix cookie recipe! I am not opposed to cake mixes. ☺️ The cookies look delicious. Your new tea cup is charming and I certainly think you should have it. I, for one, have been buying too many Merry Christmas to me gifts, but not one so darling as that! So sweet - she did a great job -- she's learned from the best! I'm not opposed to cake mix (I know some are). It's so helpful when you need a quick dessert. This week I made a chocolate cake that was just a cake mix, 1 c ff greek yogurt, 1 c water and an egg. It was SO good. Not carb free of course but definitely lower in fat. It was 64 here today!! BUT, the highs the rest of the week . . . mid 20's! BOOOOOOO HOOOOOOO!!! I'm coming to TX to sit outside and have tea with you! Christmas teacups can be hard to find. 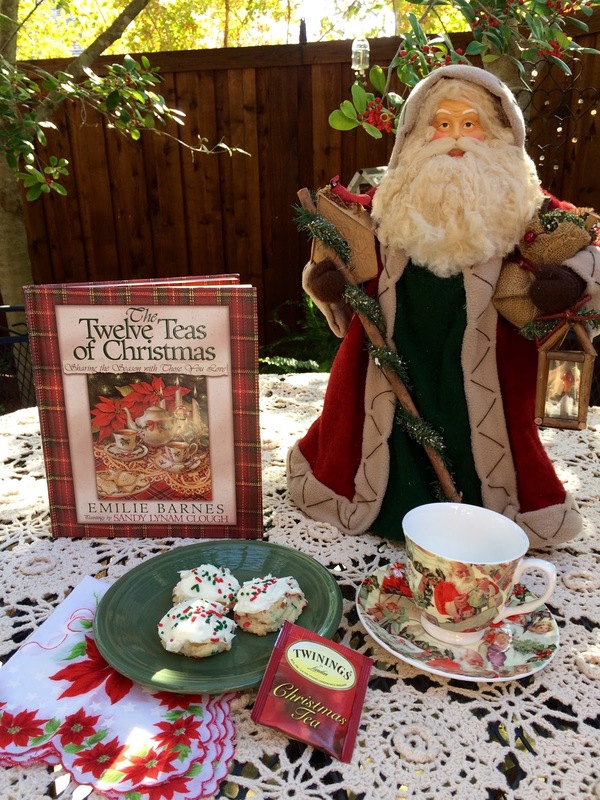 I wouldn't have been able to resist your charming, vintage-style Santa teacup either! Your book reminded me that I have some Christmas books (A Cup of Christmas Tea, The Gift of the Magi) that I haven't taken out of storage yet! I have a recipe for cookies made from a cake mix that my late grandmother absolutely loved and looked forward to every year. You brought back sweet memories of her and I with this precious post. Your tea cup is charming and will be special added to your collection. Oh, my! Those cookies look so wonderful. Zach and I will have to try making these! I wanted to tell you we made your Chocolate Crumbles (I think that is what they are called!) the other day, and I am telling you, my husband and Zach just LOVE them! I thought much of you while we were making them. Thank you for bringing so much joy into our lives. You are such a special blessing to us all! God bless you this Christmas season! Kitty, the cookies look delicious, and who doesn't like easy! I love that you and your granddaughter like to cook together. Enjoy the holidays with those cuties in your life. What a beautiful outdoor leading photo! Your teacup is gorgeous, glad you bought it. That would've been one you would've kept thinking about. Hi Kitty, Love these cookies and they sound so easy to wipe up. Cissy did a beautiful job of baking. Your teacup is gorgeous and so festive for Christmas. Love your outdoor setting! Enjoy this new week and our cooler weather. Your tea table is delightful and those cookies melted in your mouths I'm sure. Cute Santa and sweet tea cup. I will have to look for the Twinging Christmas tea. She did great! And it's so much fun to learn to follow the directions. That's really all we need to do to be good cooks! Love everything old fashioned for the holidays! Hugs! Cissy is so sweet! she's going to be quite the baker!! these little morsels sound delicious with the cream cheese added to it! YUM....The setting looks so pretty too and quite festive!! Kitty, Thanks for sharing your new Christmas teacup. Have a great week. Sylvia D.
Definitely destive goodies! And your cute elf is such a wonderful help! 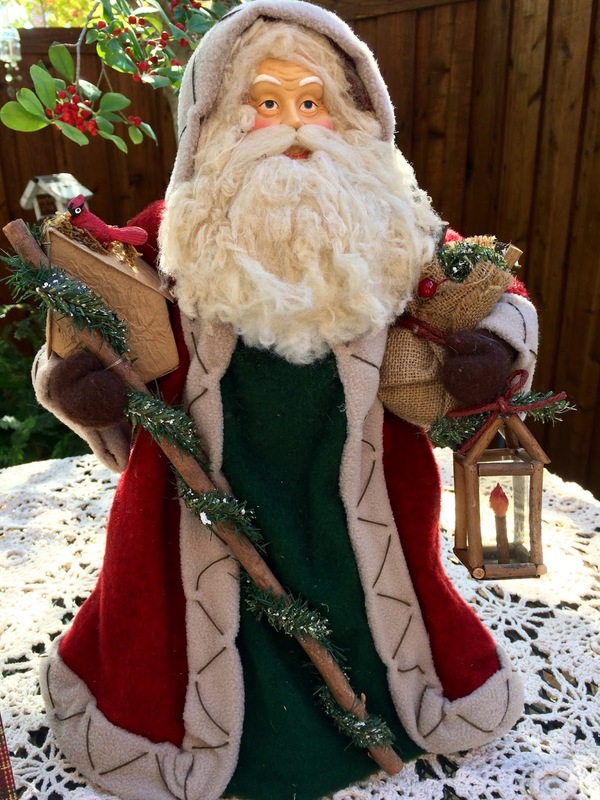 I love your Father Christmases...so festive! Thanks for linking to Tuesday Cuppa Tea! he cookies look so delicious and I love the Santa with the cardinal. It reminds me that just today I saw cardinals on our bird feeder today and I was so thankful they have returned for the winter! There is supposed to be a "T" at the beginning of that comment...lol! Your new teacup is so pretty. It would be hard to resist! Love seeing your grands baking in your kitchen. Kitty, who thinks up sweet details like the birdhouse and lantern! How wonderful that you have Cissy with you in the kitchen a lot! I would be opposed to limiting myself to one of these cookies! I could eat three and with a cup of coffee? Yummy!! These look cute and sound amazing! What a lovely tea setting for a special tea with a special granddaughter. Those cookies look delicious! Hope you have a great week and thanks so much for sharing with us at Full Plate Thursday. Dear Kitty: Those cookies look delightful and delicious. I especially love that Emily Barnes Cookbook as I have one too. I see Holly with red berries in your garden and that would be so wonderful. I planted a small bush this summer and hope it grows fast but don't think so. I love your Father Christmas and his bird theme! Thanks for sharing and linking last week and all throughout the year.